Delivering the future of business analytics, Pentaho Corporation (Xpand IT official partner) today announced that it was named a “Hot” Vendor in Ventana Research’s new 2012 Value Index for Data Integration. Inclusion in the highest-ranking category assures buyers that the Pentaho Business Analytics platform delivers optimal value, product maturity and superior customer support, according to Ventana Research’s comprehensive evaluation. Pentaho Business Analytics combines data integration and business analytics into one platform so IT and business users can easily access, integrate, visualise and explore any data to positively impact business results. The platform’s data integration capabilities support access and integration from any data source, plus deliver data to business applications within an intuitive, easy-to-use graphical tool. Pentaho also offers native support for the most popular big data sources including Hadoop, NoSQL databases and analytic databases. With continuous volumes and increased variety and velocity of data, organizations need fast and easy ways to integrate data as well as gain insight from it,. That’s why the intersection of business analytics, data integration and big data is more powerful than ever before. 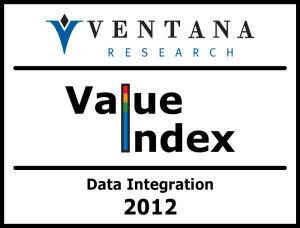 The amount of in-depth research conducted for the 2012 Ventana Research Value Index for Data Integration makes it a valuable independent resource to help demystify and expedite the buying process. The demand to integrate timely and consistent data is placing extreme pressure to automate supporting processes to be efficient in utilizing a full range of accurate data across the enterprise and Internet. Our comprehensive vendor and product research looked at over a dozen vendors, recognizing those that offer mature software and provide benefits planned for as part of an investment. Pentaho should be congratulated for its rating as a Hot Vendor, the highest level, based on its reliability, adaptability and manageability of its technology and for its commitment to TCO and ROI. Pentaho is delivering the future of big data business analytics. Pentaho’s open source heritage drives our continued innovation in a modern, integrated, embeddable platform built for the future of analytics, including diverse and big data requirements. Pentaho is the only vendor that provides a full big data analytics solution that supports the entire big data analytics process, from data integration through interactive data visualisation, exploration and predictive analytics.